Sandringham, a bayside residential suburb, is 16 km south-east of central Melbourne and 4 km south of Brighton. The area was first known as Gipsy Village, from a fishing community which occupied the coast line around Picnic Point, out of sight of Brighton. In 1852 a land speculator, Josiah Holloway, attempted to sell off allotments, named the ‘estate’ Gipsy Village. (The proposal was ahead of its time, as the railway line did not reach Brighton until 1861 let alone the extension to Sandringham in 1887). In 1855 a school opened in the Anglican church. 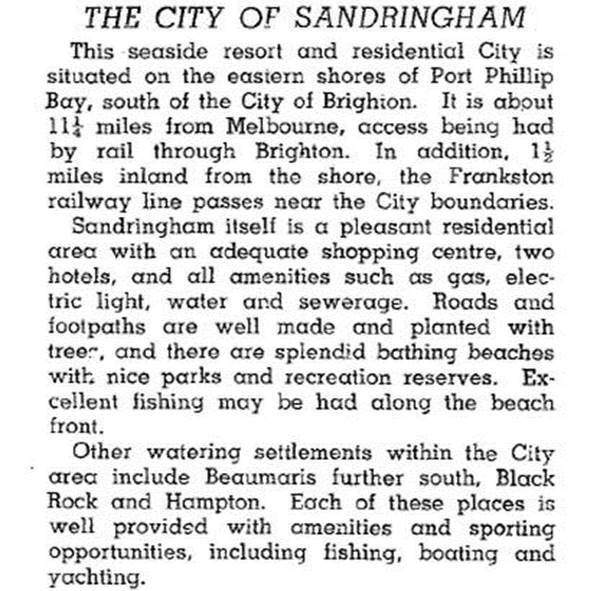 Sandringham was part of the Moorabbin shire, and the west riding which comprised the bayside townships of Hampton and Beaumaris agitated for separation in the early 1900s. The foremost proponent was councillor Elisha De Garis, Mildura irrigationist and father of the more famous Clement De Garais who pioneered the dired fruits industry and the Sunraysia Daily newspaper. Both are buried in the Brighton cemetery. Sandringham technical school was opened in 1949. It later became a senior secondary college campus. A Catholic primary school (1912) is east of the railway station. The Sandringham township is centred on the railway station and Picnic Point. The Point has a large reserve with an oval, croquet green and sporting clubs’ rooms. Seawards is the Sandringham Yacht Club, a boat harbour and a breakwater which contains a submarine wreck. A beach leads on a foreshore reserve which runs to Brighton. The compact shopping centre is next to the railway station. When the Royal Melbourne Golf Club enlarged its greens in 1932 it disposed of its westerly property as the Golf Links Estate. Subsequently part of the estate became the site of the Sandringham Council’s civic offices, a large reserve and the memorial hospital (1965). On 15 December 1994, Sandringham city was united with Brighton city and parts of Moorabbin and Mordialloc cities to form Bayside city.